ExpertOption – another broker among the young companies, offering binary options trading services. The company is registered in 2015 in Great Britain, but there is still no information whether it will get the British FCA license or not this year. But the license of Russian regulator CROFR was issued long ago and is still active. low threshold for entrance into trade with the aim of attracting potential clients. minimum deposit – 10 USD (or 500 RUR), minimum stake - 1 USD. There is a tutorial block of trading recommendations for the beginners. 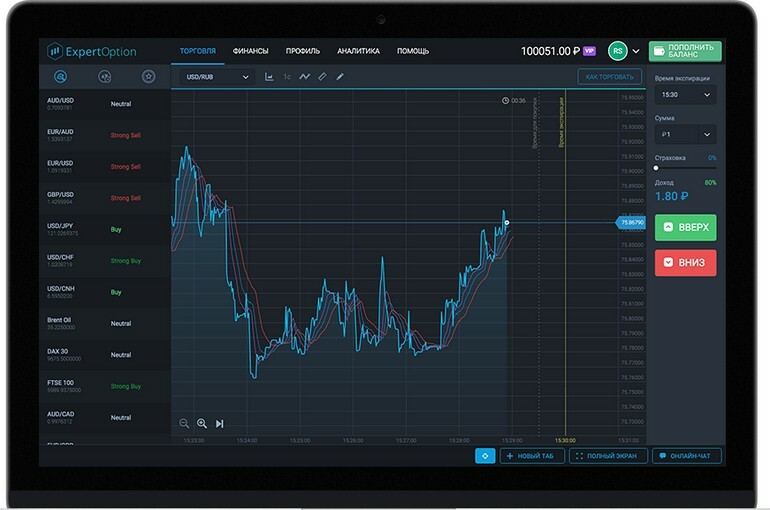 For real traders ExpertOption offers 5 types of accounts depending on the deposit. Minimum deposit (in rubles) is 500 RUR, maximum 200 000 RUR. Variants of options are rather limited from ExpertOption: so far only the classic quick options with the expiration time from 1 to 3 minutes are available for the investor. Soon the long-term options (24 hours and 1 week) should appear. The main feature of deals from ExpertOption is that the broker provides, in some cases, a refund of 30-50% of the investment in case of wrong prediction, whereas other brokers in most cases do not return the money, calling it a loss of the investor. However, 30% are returned when with Silver status, 50% with Vip status. convenient interface and changeable number of Windows (for example, it is possible to work with 4 independent options). After you tried the free demo account, where 1000 points are offered for the experiment, we offer to try your forces on real trading. Quotes for any asset are displayed in ExpertOption trading platform in real time if the real account is opened (the quotes provider is Claws&Horns). To register: enter contact information, confirm email address, add fungs at "Finances" section. Depending on the Deposit amount a trader can be assigned various status that determines the amount of bonuses offered by the broker. Important: the bonuses provided by ExpertOption, must be worked out in consequence. Therefore, we strongly recommend that before you accept the bonus, contact the Manager and clarify what it will require in the future. Remember that the speed in making a decision is important in short-term trades! And the trade copied from the successful trader with a delay of 30 seconds on the contrary could be wrong. Replenishment is possible via a popular e-wallets, and Bank cards of international payment systems. Deposit currency is US dollar and Russian ruble. Withdrawal of funds is carried out within 3 days. For verification data a passport scan and scan of the card on which money can be withdrawn can be required. To sum up: ExpertOption is gaining its weight in the market of binary options. Some of the benefits of the broker are obvious: the minimum rates, small deposit, expedited withdrawals. However, in order to feel the real difference of ExpertOption from other brokers, you need to try to work with him. We are sure that you will certainly find something interesting in it. ExpertOption - reliable broker for good income! I was able to make money with this company is really good money. In terms of profit so far, no issues, and is removed quite quickly for me. In my opinion, the broker is great. I already long enough work with him, and so far no complaints. My results are quite satisfied. Broker was pretty good. During the work with this company, I have only positive reviews about this broker. In my opinion, this broker is really worthy of attention. During all the time he has worked with him, there have not really been any questions. Very pleased that the broker did not disappoint. Went and worked on a demo, then moved on to the main. Just did a test payment and everything works. The company is quite good. In my opinion, to work with him was really beneficial. I was pleased with the results. The broker I really enjoyed it. Working with him really was easy, besides the profit are quite happy. Quite a good broker, as for me. While the results I was quite satisfied with the broker can be bad enough to earn. For me this broker are quite satisfied. While the results are really encouraging, and the profit is still quite good to me. Competitor current leaders rostet pretty good. Broker is really good, I really liked.